It is with sadness that I am announcing the retirement of Dr. Betty Inclan as President of Berkeley City College. Dr. Inclan has written me that she plans to retire from the California Community College system at the end of this academic year in order to spend time reuniting with her family and return back home to the Central Coast. I am very much appreciative of the outstanding work Dr. Inclan has done for over four years as President of Berkeley City College. Throughout her tenure at the college, she has worked forcefully to make it the outstanding institution of higher learning that it is. And it is with pleasure that I announce my appointment of Dr. Debbie Budd as interim President of Berkeley City College, effective June 4, 2012. Many of you have worked with Dr. Budd at both Berkeley City and in her current position serving as the Vice Chancellor of Educational Services for the Peralta Community College District, and know that she is a talented and experienced educator and administrator. She has a great deal of experience with enrollment management, grants, and facilities bond implementation, and has expertise in working with faculty to develop innovative programs to increase student success. Dr. Budd has over 16 years of administrative experience and nine years of teaching experience. Prior to working at the district office, Dr. Budd served as Vice President of Instruction for Berkeley City College. Previously, she was Vice President of Educational Resources and Instruction for Foothill College in Los Altos Hills, and previous to that, served for six years as the Dean of Applied Health, Physical Education and Community Affairs for Chabot College. In addition to her community college experience, Dr. Budd has been both a teacher and administrator at the middle and high school level. She received her Bachelor’s degree in Business Economics and Physical Education from University of California at Santa Barbara, her Master’s in Education from Stanford University, and her Doctorate in Educational Leadership from San Francisco State University. Let us thank Betty for a job well done at Berkeley City College and welcome Debbie as Berkeley City College’s new interim President! Dr. Harinder “Hari” Singh has been named dean of academic pathways at Berkeley City College, Dr. Betty Inclan, president, announced. Singh will supervise BCC’s arts and cultural studies, biotechnology and science, English/ESL, and social sciences departments. He also will work closely with the college’s dean of workforce development to create new collaborations among BCC’s instructional departments. “I strongly believe that both the liberal arts and the business framework can complement each other and provide a stronger foundation for students to solve complex real world problems,” Singh said. He most recently was director of assessment at Seidman College of Business at Grand Valley State University (Grand Rapids, MI), and also served as editor of the Seidman Business Review. During his academic career, he was chair of the Economics Department at Seidman and was a professor in San Diego State University’s economics department. His background includes extensive experience with curriculum development, scheduling, grants, research, and supervision of instructional programs. In his last post as director of assessment at Seidman, he coordinated assessment activities for five programs, with a specific focus on the development of basic skills for students in communication, critical thinking, quantitative skills, and ethical reasoning. 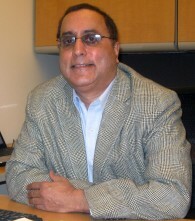 In 2011, Singh was awarded the Niemeyer University Award for outstanding teaching, administration, research, and service. The prestigious award is given to only two faculty members each year. Singh received his M.A. in economics from DAV College in India, and a Ph.D. in economics from the University of Illinois at Chicago.